Winnepeg, MB Canada - Russel Metals has installed a new Braner/Loopco Hydraulic Cassette Leveler/Electronic Servo Feed Cut-to-Length Line at its Winnipeg, MB coil processing and metal distribution facility. The state-of-the-art CTL Line processess a wide range of products and gauges, including hot rolled black, pickled, cold rolled bare and coated, aluminum, and stainless steel coils through 1/2" thick. Russel Metals' Cassette Leveler CTL Line is capable of processing an extremely wide product and gauge range. Master coils are staged on an Entry 4-Arm, where a floor level Car transports and loads coils onto the Uncoiler. 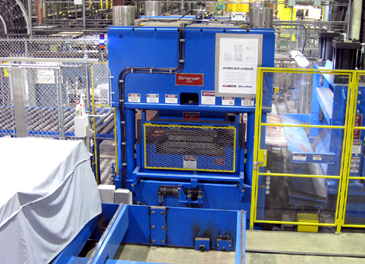 An Entry Coil Flattener straightens and threads the coil into the Entry Shear where the head end is cropped-off and collected in a Power Scrap Cart. The massive 4-post 1/2" "Plunge" Cassette Leveler employs rows of hydraulic cylinders rather than screw jacks and sliding wedges to position adjustable back-up flights to correct strip shape defects and generate panel-flat strip. Computer controlled linear voltage transducers accurately position each independent cylinder. Adjusting the entry and exit end cylinder elevations causes the work rolls to be "tilted" front-to-back for coil-set and cross-bow correction, and adjusting cylinder elevations from side-to-side achieves "roll-bending" for edge-wave and center-buckle correction. Russel Metals' Hydraulic Leveler features full automatic set-up based upon gauge and yield strength parameters, automatic set-up via order recall memory, and automatic Leveler calibration accomplished without tools. Russel Metals' Cassette Leveler employs three (3) interchangeable Leveler Cassettes to level the full gauge range of carbon steel, aluminum, and stainless coil. An 11-roll x 4-hi Cassette is utilized for leveling heavy-gauge hot rolled coil. A smaller 17-roll x 4-hi Cassette levels thinner gauge non-critical coil, while a third Cassette, a 17-roll x 5-hi Cassette is employed for leveling surface-critical coated carbon steel, aluminum, and stainless coil. A Power Cassette Injector Car exchanges Cassettes in about 2-minutes. A Cassette is automatically coupled to the motor-gear box drive and hydraulically locked in position inside the 4-post Leveler frame after it is installed. Each Cassette contains work rolls, intermediate rolls, back-up flights, and universal shafts that drive all Cassette work rolls. Maintenance on all the Leveler working and wear parts is accomplished outside the Leveler frame, which makes cleaning and maintaining the Leveler easy and fast. Russel Metals' Cassettes are "opened" to expose and make easily accessible the work rolls, back-up rolls, and other parts that require periodic maintenance and cleaning. 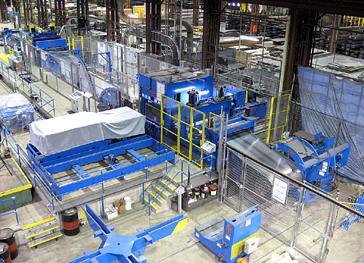 Productivity and operating efficiency is enhanced as maintenance and cleaning is accomplished while the CTL is operating with another Cassette. Russel Metals' CTL operates in a "free-loop" Servo Feed mode when processing 1/4" and thinner gauges, and runs in a stop-start mode when processing heavy gauge where a 1,000 PIW coil contains between 500 and 1,000 feet of material. A stable free-loop is maintained during the feed/shear cycle by a non-contact sonic sensor installed halfway along the loop length.